Jo-Sha Wipes are natural, cleansing, yoga mat wipes infused with soothing essential oils. You will appreciate having a clean yoga mat on which to practice while you enjoy the healing benefits of essential aromatherapy oils like Lavender and Tea Tree. Jo-Sha Wipes dry quickly and evaporate completely, leaving the yoga mat with its important sticky surface and a faint lingering scent that invigorates the senses and adds to your yoga practice. Each wipe is infused with one of four essential oils to provide that soothing scent during and after cleaning. Use Tea Tree for the soothing sense of Nature. Use Lavender to restore balance and evoke a sense of calm and relaxation. Not only will you have a clean mat, but you will get the benefits of healing aromatherapy. Available in Lavender or Tea Tree. Wipes are in a re-sealable sticker top package that contains 30 wipes (similar package as baby wipes). Ingredients: Water, Aloe Vera, Polysorbate 20, Optiphen, Essential Oil, Vitamin E, Citric Acid. The 30-pack sticker top bulk packaged wipes are in re-sealable dispenser bag. 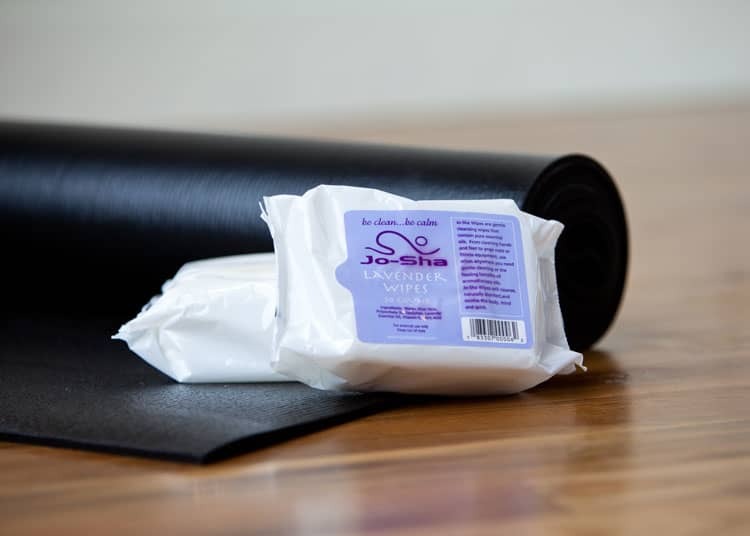 These yoga mat cleaning wipes are not indiviually packaged and are therefore great for use in yoga classes or at home, where individually packaged wipes are not necessary. These are the same wipes as the individually packed ones, just bulk packaged for better value. Available in Lavender and Tea Tree only.